Account based marketing, also known as ABM, is a strategic approach to business marketing in which an organization focuses its marketing and advertising efforts on targeted opportunities and the individuals within an organization that will most likely participate in the decision-making process. Rather than treating marketing, advertising and sales as a numbers game and casting a wide net, an account based marketing strategy focuses on a small handful of prospects and marketing assets are tailored to the individual. Advances in data collection, analysis, and management, combined with the way that the internet is reshaping how businesses connect, engage and make purchase decisions, has led to a new economy of increasingly integrated, personalized and targeted sales and marketing. Now, working in tandem, Sales, and Marketing departments can leverage these changes to collaborate and flip the traditional sales funnel with an account based marketing (ABM) strategy. Rather than starting with the widest part of the funnel which begins with leads and narrows into the prospects who eventually become buyers, ABM is about starting with the narrow part of the funnel and expanding from there. An ABM strategy targets the accounts (businesses) that should have a high propensity of interest in your products and services, converts them into customers, and then converts those customers into advocates who can grow your business through referrals. Flipping the traditional marketing funnel on its head can appear a little daunting at first, however, there are several vendors and platforms available that can simplify the transition. 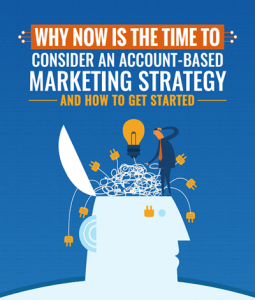 There are some very good reasons to consider an account-based marketing strategy for your business. Below are a few to consider. B2B buying decisions used to come down to connecting with one person, creating a relationship, and then convincing them to make a purchase. The general idea was to use marketing to find people who might be interested, and then take those leads and guide them through the sales funnel to eventually create buyers. The problem with the funnel model for B2B is that businesses have radically changed the way they now make buying decisions. The internet has empowered companies to do extensive research into what options they have when trying to fill a need. An oft-repeated number is that B2B buyers are already 57% of the way through their purchasing decision before they even contact you. Additionally, CEB research shows that 5.4 is the average number of decision-makers involved in a single B2B sale. Additionally, insights from Google reveal that nearly half of all B2B researchers are millennials. And although the c-suite often signs off on the final decision, 81% of the non-c-suite have a say in purchasing decisions. The mythical decision maker (persona) you attempted to reach in the past to make a big sale simply no longer exists. Decisions are made by research done by teams of people and influenced by stakeholders and others. ABM helps you focus on what matters by looking at marketing targets in terms of the account, rather than individual leads or decision-makers, with a focus on fit within the organization. Businesses need to recognize that they are no longer marketing and selling to a lead. They’re marketing and selling to an account. An account with multiple stakeholders and a variety of roles and influences. In today’s B2B’s landscape, buyers are in the driver’s seat. They don’t need to rely on brands to tell them what is best for them. They can independently determine what they need and search the Internet to find and evaluate each of the options that are available. While not everyone has gotten the memo that cold calls and outbound emails are increasingly unsuccessful, it doesn’t change the reality: customers are resistant to traditional sales tactics. The internet has created an ecosystem of customization and niches. People see what they want to see, and push everything else away. Content marketing has taught us that to garner attention we need to build something that customers want to engage with – but that’s only half the battle. ABM teaches that you need to think about who wants to see what you’re making and tailor your marketing messages to them specifically and personally. The conventional wisdom is that marketing should be judged by how many qualified leads are being generated. The idea is that marketing produces the leads, hands them off to sales, and then sales convert them into buyers. Unfortunately, this strategy isn’t very effective in today’s marketing landscape. Research from Forrester shows that less than 1% of leads ever generate revenue for B2B companies. That’s a terrible ROI. In reality, sales leads are not a strong metric in terms what really matters to the organization. Instead, marketing needs to align with the bottom line for your business: revenue. Marketing needs to be in lockstep with sales, improving conversion by improving their targeting. On top of that, a major focus should be on improving proven methods for driving sales, like referrals. As the saying goes, 20% of your customers are responsible for 80% of your revenue. Add to this that a significant shift is taking place in business today. Companies are turning to ABM programs because they recognize that the traditional B2B sales funnel no longer exists, and the path to purchase has become increasingly complex. The B2B landscape is evolving, and sales and marketing departments need to be much more aligned in order to grow revenue in this changing environment. The amount of data we’re able to collect about our customers and prospective customers has increased exponentially. Tracking individual buying journeys is easier than ever before, and when you combine that with the ABM mentality of flipping the funnel, you can generate some pretty powerful insights. Look for patterns in successful buying journeys and what commonalities might exist between buyers beyond what’s obvious at first blush. Guess what doesn’t really matter to a growing number of B2B marketers? Leads, Impressions, likes, and reactions, or for that matter, any vanity-type metrics. What does matter? Sales and revenue. It’s simple. Millions of impressions, thousands of likes, or hundreds of leads mean very little unless they at some point convert. 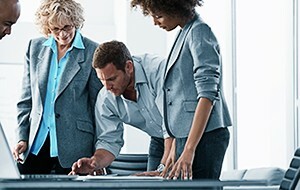 Ten targeted, high-value accounts that convert will be much more important and valuable to your organization than 500 leads chased over several months that do nothing – but there is a conversation that will need to take place to explain the changing metrics to your organization should you adopt an ABM strategy. Although there are several items that can be measured with your ABM strategy, the most important KPI’s are fairly easy to track. How many accounts did you target? How many targeted accounts did you close deals with? How much revenue did they bring in? Traditional marketing tactics are quickly becoming less relevant in the eyes of consumers. Banner and display advertising has never been as ineffective as it is today. Gated content is rapidly disappearing. Ad impressions don’t necessarily lead to conversion. Ad blockers are being used by upwards of 60% of Internet users and growing. Deep personalization, Artificial Intelligence, and Machine Learning are rapidly outpacing traditional forms of advertising. Now that we’ve established the need for an ABM program, let’s take a look at what it’s going to take to get started. First, as you begin to explore and map an ABM strategy you’ll need to define the goals of the program. Are you hoping to grow your overall customer base, or specific verticals, or demographics? Do you want to retain current customers or upsell/cross-sell existing customers? 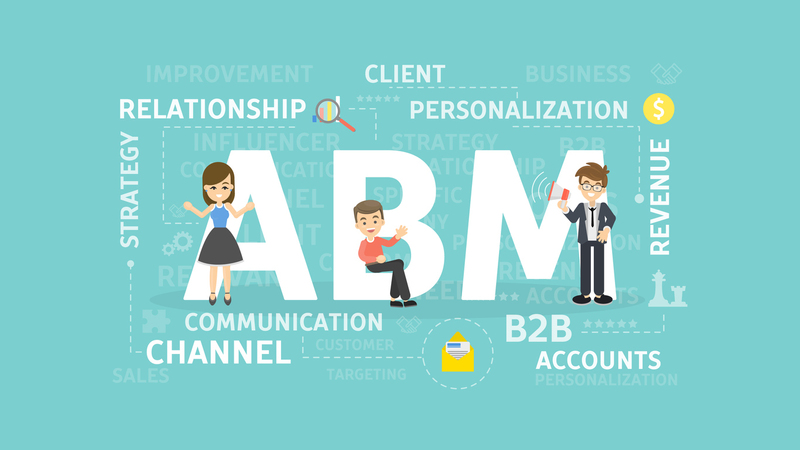 The answers to these questions and much more will guide you as you create your ABM framework. With ABM, you need to start with what works for you. 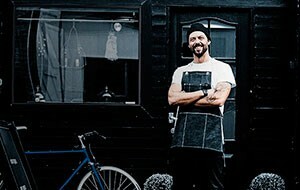 Who are your ideal customers? Start by looking at the clients that you already have. Ask yourself what makes them such an ideal fit for your business. Beyond the fact that you fill a need for them, you need to consider other factors that might have caused them to choose you. Maybe the culture is a particularly good fit, or maybe it’s location or customer service. Whatever it is, you need to figure it out because that research will tell you who you need to target with your marketing messages. Don’t be afraid to plan your strategy around different types of accounts. One of the appealing aspects of adopting ABM is that you can tailor your message to a hyper-specific audience. This helps you hone in on who you’re trying to reach and how you will engage them, but you must do your homework. Your primary objective is to identify target accounts that are most likely to result in closed sales with significant revenue. This is the primary reason why sales and marketing must work in concert with each other. You are creating a single, cohesive strategy for both departments. Together, marketing and sales will need to look at all potential accounts and filter the list to a manageable number of targeted businesses. With either department operating independently of the other, the probability of success will be remote. The first question will most likely be how the list will be created. Will accounts be selected manually, using basic data, advanced data or predictive analytics? One additional factor to consider as you narrow your list will be the ability of your target accounts to close a sale with your organization that meets your objectives. As they say, “timing is everything,” and with ABM, that couldn’t be truer. Select your target accounts wisely, not wishfully. You are looking for accounts with the best potential. Avoid a broad, general list that will easily lose the focus of your organization and focus on a narrow, but solid list of target accounts. How will your sales and marketing departments work together to identify target accounts? What will the criteria be for selecting targeted accounts (location, vertical market, size, opportunity, relationship, etc.)? How many accounts will be targeted? Who will have ownership of the accounts? Who and how will planned engagement be mapped (events, webinars, direct mail, email, advertisements, content placement, live contact, etc.)? Once you determine the methodology for targeting accounts, you will need to determine what account insights will be of value. What news, trends, or marketing dynamics are currently affecting the target account? SWOT Analysis: What is their overall business strategy, culture, strengths, weaknesses? What solutions does your organization offer that can meet their current needs? Relationships inside of the account: Who is connected? Who influences whom? Connections to the account (outside): Who currently has key contacts with sales, marketing, and customer service? As I mentioned previously, organizations need to recognize that they are no longer marketing and selling to a lead; they’re marketing and selling to an account. An account with multiple stakeholders and a variety of roles and interests. And although you are focused on accounts, the decision makers are still the people connected to those accounts, and that’s who you need to connect with. This is where having reliable, accurate data is essential. You’ve already narrowed your list of accounts and now you need to begin to understand how many people within the organization you will need to engage with, who they are, and what are their roles and level of influence is in the purchase decision. There are several technologies and platforms available to assist with this, but if you get this part wrong, your ABM program will struggle. If, because of bad data you’re engaging with everyone but the key influencer of a high-value target, or you have multiple sales and marketing reps with overlapping engagement, the entire campaign could be in trouble from the start. So, how do you know? There are project champions, and there are deal blockers in every organization. To be effective and successful you will need to identify and engage in the right way, with both. One of your best tools for reaching these influencers and decision makers, and understanding their roles, will be to leverage an account-based advertising vendor. Using your target account list these vendors will deploy targeted messages to specific roles and individuals within the targeted accounts. This way you can tailor and personalize your message, rather than sending the same message to everyone. Relevancy is key to success with ABM—relevancy to the target account and relevancy to the individuals you’re engaging with. Additionally, sustained and consistent social engagement is an important element of a successful ABM program, and there are several considerations. Who will monitor the social feeds of your targeted accounts and the potential leads within the account? Who will engage with targeted account and individuals associated with it? Who and how will you engage with content once it is deployed? Who will quarterback the account to advise what content is needed, when, and targeted to whom? This will also be the individual responsible for monitoring of the target account and individuals associated with it to ensure new content opportunities are addressed. 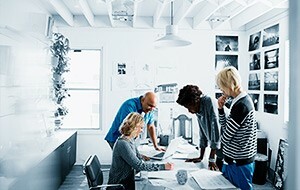 What is the new role of social media, content, and engagement in the organization? How will various social platforms (Facebook, LinkedIn, Twitter, etc.) be used? An important reminder: Engagement doesn’t end when the deal closes. In fact, that signals the beginning of a new phase of the relationship. There will be continued monitoring of customer experience and satisfaction, additional needs and more. Additionally, if you’ve done it right you’ve built several strong, ongoing relationships along the way. ABM focuses on accounts, rather than markets, personas, or segmentation. Because of this, research and an in-depth understanding of the target account are critical to developing content and campaigns optimized specifically for them. Taking a “one size fits all” approach to your content in which you focus on a broad market, vertical, or topic does not work with ABM. Content must meet a specific need of the target account and address specific solutions to the challenges the organization faces. Robust content marketing availability will play an important role in the success of your ABM strategy. Because individuals consume, engage, and receive value differently from content, you will need to have a variety of content at the ready. Blog posts to boost in their social feeds, bite-sized content that drives to deeper white-papers and ebooks, webinars that engage, and videos that entertain will all be important tactics. Each piece should be tailored not only to the verticals you are focused on but to specific accounts. Focused, personalized content is important and improves the chances of you getting the attention of individuals from inside the target account. Before going further you’ll again need to answer a few questions. Who will conduct the research and determine what content is needed? How will content be created, stored, managed/updated, and deployed? How will you determine what content is delivered to “who” in the target organization, and when? Do you have the resources needed to supply relevant content to the target accounts on your list? Engagement also needs to go well beyond email and social media. Surprise and delight tactics like a Starbucks card on National Coffee Day or donuts for the entire office on National Donuts Day are just a few ideas. There are others, and they all work together to deepen and nurture the account relationship. You might look to stage small but valued events within specific verticals with high-value accounts; like lunch and learns, knowledge workshops, etc. These all provide opportunities to have conversations with target accounts that feel natural (and not like a sales call). The cumulative effect is to consistently nurture the account and demonstrate your organization’s ability to provide a valued solution. Indecision and inaction are the enemies of ABM. Engagement keeps the conversation moving towards the goal. Without engagement and cadence, the buyer’s journey will stall. Each account will need to be a part of an ongoing engagement plan. As your target account moves closer and closer towards becoming a deal, engagement must be measured and responsive. Marketing messages should be light and non-intrusive with a focus on the personal relationship the primary account manager has developed. Sales and marketing departments need to be more aligned than ever at this point as a misstep here can be costly. Account-based marketing can be challenging without the right tools and resources. It requires a much deeper level of personalization, customized content, and engagement than almost any other form of marketing. Additionally, you’ll need a way to monitor, track and measure activity around account campaigns that is timely, accurate and insightful on several levels. The value of a CRM in account-based marketing cannot be understated. You will need a reliable method of matching leads to accounts. Lacking this ability, you won’t even be able to get started. Your CRM will be used to identify individuals within a targeted account, by their name, role, etc., and also for site-level matching — the ability to map the organization’s local offices, branches, and subsidiaries. Without a robust CRM, sales and marketing reps could easily be wasting time and resources on different levels of an account without knowing it. You’ll need a CRM that can keep all of the information in one place. Additionally, your CRM will ensure that both marketing and sales are working with the same information, and your CRM will feed this information to your data or ABM platform. There are a number of strategic approaches to account-based marketing that organizations take. You will need to determine which approach is best for you business based on need, resources, and budget. Additionally, you’ll want to consider which technology and ABM platform your organization will use to drive and manage the strategy. There are several to choose from. Below are just a few. Terminus: A pure ABM platform that focuses on advertising and analytics. Pick out the accounts you want to target using Terminus’ IP library (even if they’ve never visited your site), specify personas, and run your creative. Then look at how it performs. Engagio: This platform plugs into your marketing software to help make your ABM efforts coordinated. If you’re trying to work accounts across multiple channels and multiple teams, then take a look at their Playmaker functionality which helps you keep things orchestrated. Marketo: You might already be using this broader marketing engagement and automation platform to handle your other needs, but it also has the capability to add ABM tools to help you flip your funnel. Triblio: This platform brings a visual flair to your ABM planning that makes it easy to see all the different resources you have at your disposal, then lets you make changes on the fly without needing to code. Madison Logic: This full-funnel solution is driven by intent data, so it helps you to identify and target prospects when they are exhibiting behaviors that indicate they’re likely to buy soon. You may determine that the best initial approach is one that takes your current advertising plan and simply changes the focus from a broad-based advertising strategy to one that includes a focus on targeted accounts in specific verticals or market segments. Although many organizations have been successful with this strategy, it is not without some risk. If the data or methodology for determining which accounts will be targeted isn’t correct, you could be wasting a great deal of time, money and resources on a strategy that is in trouble from the start. Additionally, managing a paid media strategy for an ABM program, as opposed to a broad-based “one-size-fits-all” paid strategy, can be much more complex. Rather than a single ad or piece of content being placed for a broad segment, you instead use multiple pieces that are strategically placed and targeted to specific accounts for very short periods of time. This process doesn’t need to be 100% manual and time-intensive, however, because there are third-party platforms that can smooth things over and help you with the workflow. Although it might seem like it, a successful account-based marketing strategy does not require a large team—as long as your team is organized and has the right tools. With the right tools and alignment between marketing and sales, most ABM strategies can be successful. Alignment between sales and marketing is the key, and this means more than a once-a-month status meeting. There must be tight integration and cooperation between the two. Sales and marketing teams must work in concert with each other to identify and target key accounts and to create campaigns that effectively engage all potential leads. If sales and marketing are not aligned, account-based marketing will not be effective. Account-based marketing is a game changer for B2B marketing and sales. By focusing on what works and trying to convert your customers into advocates, you put your energy into high-conversion tactics that promise a significantly better ROI than traditional sales strategies. Focus on accounts, not individual leads. Flip the funnel by concentrating on what strong customers have in common. Put your energy into developing referrals rather than cold calls. Align your sales and marketing to focus on revenue rather than lead generation. Design your team’s workflow around accounts. Do the research to know what matters to which targets. Use CRM to track the data you need. Continually test and tweak your approach to refine your ABM strategy and tactics. Look at ABM platforms that can turbocharge your efforts. Keep constant communication across teams to make sure things are on track.